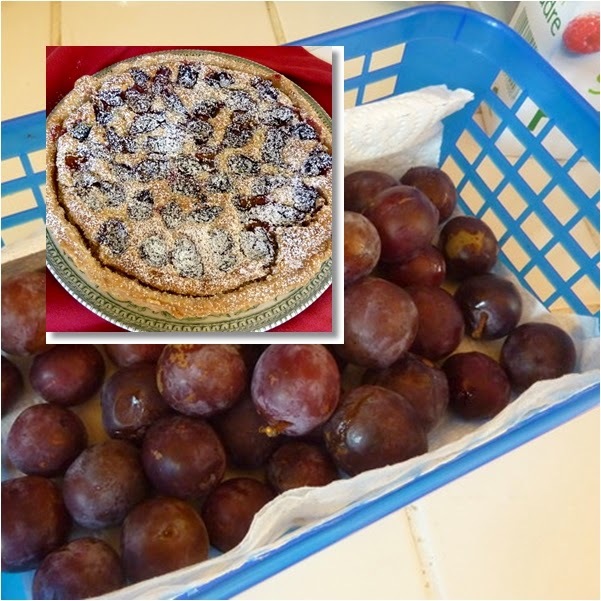 We've had a better than usual crop of plums this year more than enough to eat straight from the tree, as 1 of our daily 5 and to indulge my love of baking. 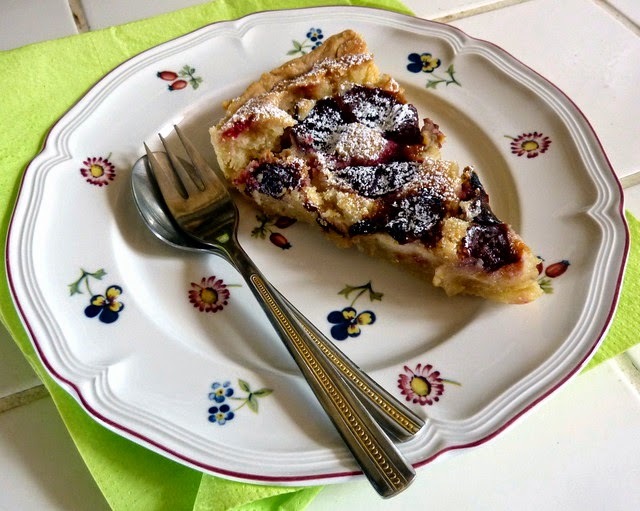 Angela Hartnett's Plum & Almond Tart with it's delicious frangipane filling was easy to make. 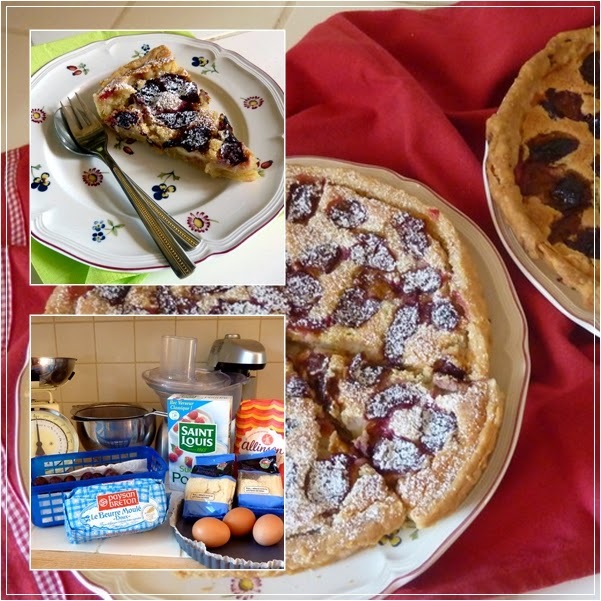 I found that it made enough pastry and frangipane for two tart's so as I had plenty of plums I made one for afternoon tea and one for the freezer, for us to enjoy later. 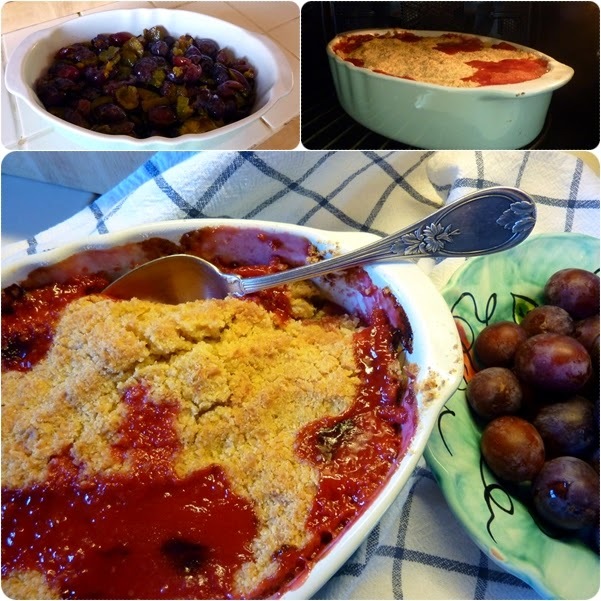 Plums and almonds were made for each other and this homely plum crumble was delicious. A perfect pud for a cold wet evening. 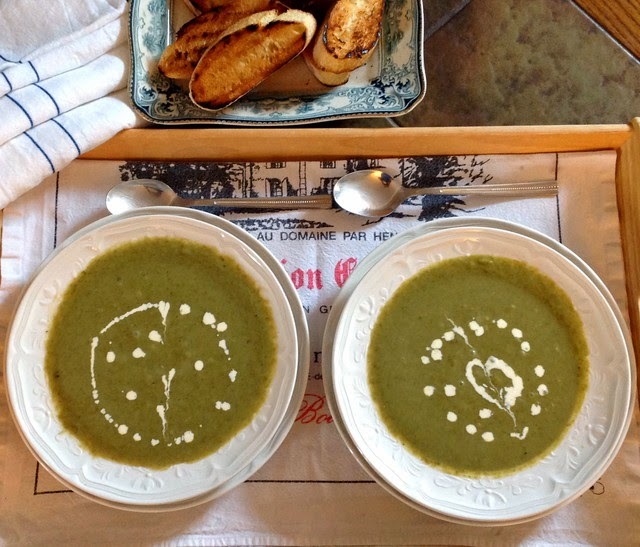 The weather this month has been dreadful and the comfort foods of our childhood are what we turn to as the afternoons get shorter and the shadows lengthen. Recently my dear friend Sarah invited me to join her on the Blogland Tour and featured me on her blog @Hyacinths For The Soul. Sarah and I have been friends since meeting at the Quimper Collectors Club’s second annual gathering in Washington D.C. in 2000.
when she & her husband came to visit in 2011. As collectors of French faience in particular the pottery produced in the town of Quimper, Brittany, we always enjoy getting together with other Q collectors. I for one am counting down the days until we meet again next month in Nice, the jewel of the French Riviera. 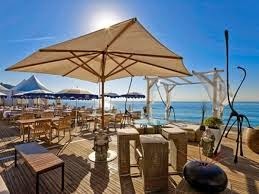 plage Beau Rivage, Nice, France. As part of the tour Sarah gave me 4 questions to answer. First of all with my Quimper Club Secretary’s hat on I’m working on preparing a report to present at the meeting next month. Mark Twain once said “there are two types of speakers, those that are nervous and those that are liars”. I know which type I am, addressing an audience is not something I am very comfortable with doing. Luckily I only have some statistics relating to the membership to report, so I think I’ll be o.k. Around the Presbytere I’m working on keeping everything “show home” ready as we never know when the Immobilier/ estate agent might call to arrange to bring a client over to view the house. 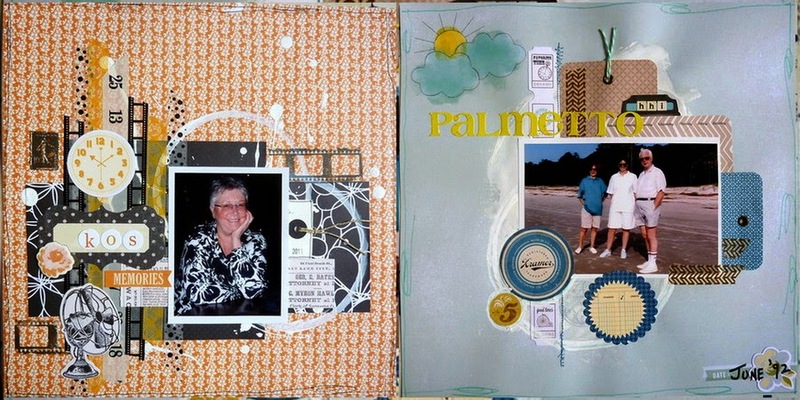 My precious “me time” is spent in my attic craft room and it seems that lately I've been scrapping vacation memories. Some of my most recent pages. Such a good question, but I’m not really sure that it does. 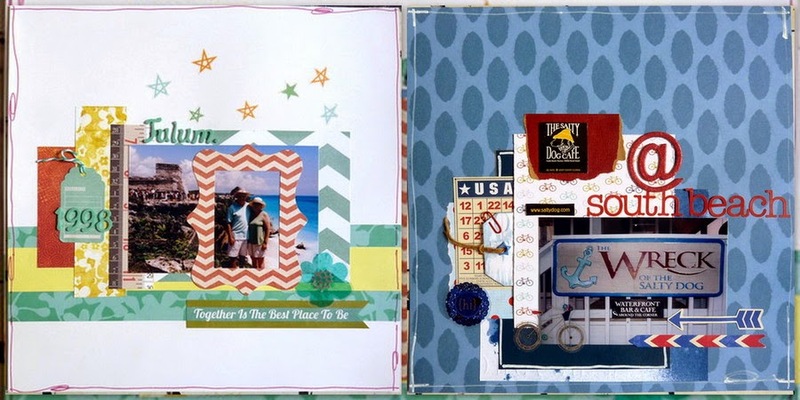 I do have certain things that I like to include on my scrapbook pages, whether I’m following a sketch or a set of criteria set down in a challenge. I usually draw doodle a couple of lines around the edges to frame the layout. Tags! Almost every layout has to include tags wherever possible and I love to pile on embellishments in clusters and layers. These are my “signatures” I guess. 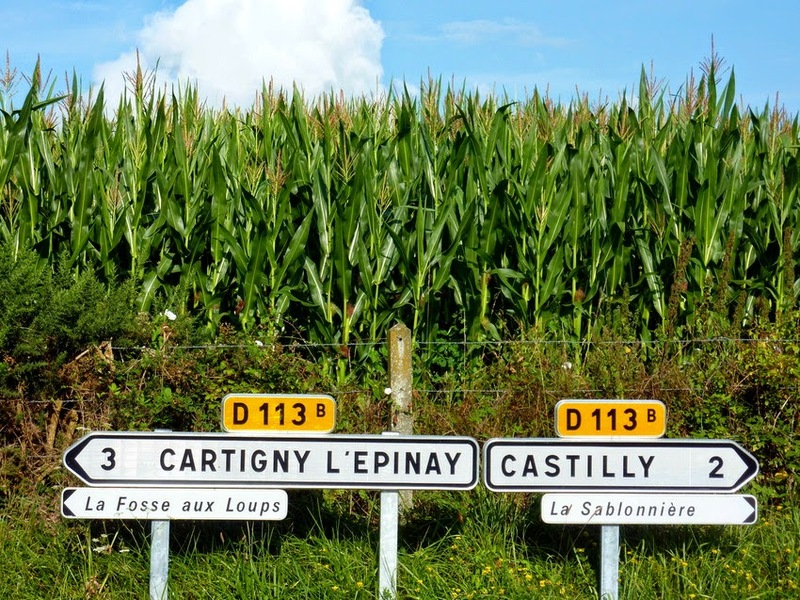 The simple answer is that I started my blog to share our life in Normandy. Our beautiful home, which we fell in love with the first time we saw it, is in a very small rural hamlet and there’s not a lot to do here if you’re not a farmer! 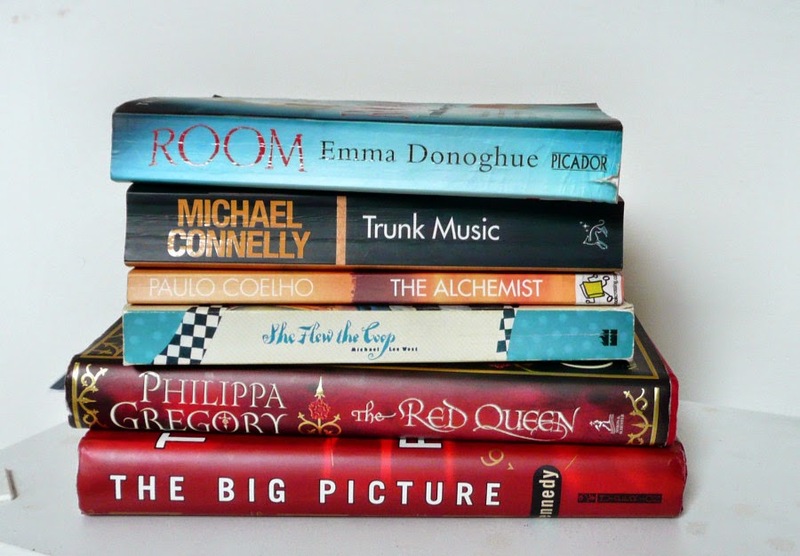 In 2008 when I first started blogging I had no idea if anyone would be interested in my ramblings but just started chatting as if to a friend and went on from there. 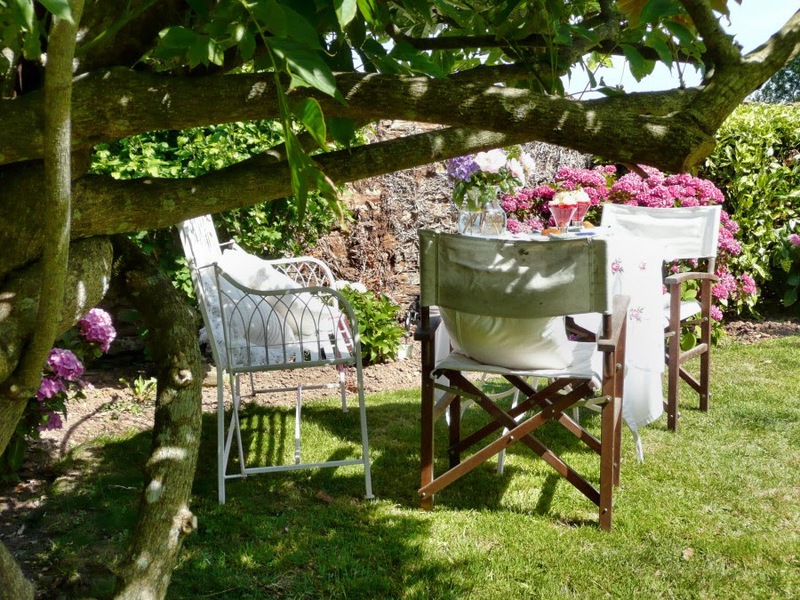 I write about my garden, especially the potager, our pets, my husband, our little trips around the area and those to more faraway places. Blogging and scrap booking are the perfect hobbies for me. How does your writing process actually work? I always have my camera close by and anything such as my latest read, a beautiful sunrise, a bee on a lavender bush, a dog looking cute, white fluffy clouds or a new recipe can easily find its way onto the page. It’s almost always the photograph that dictates the post and inspires my words. 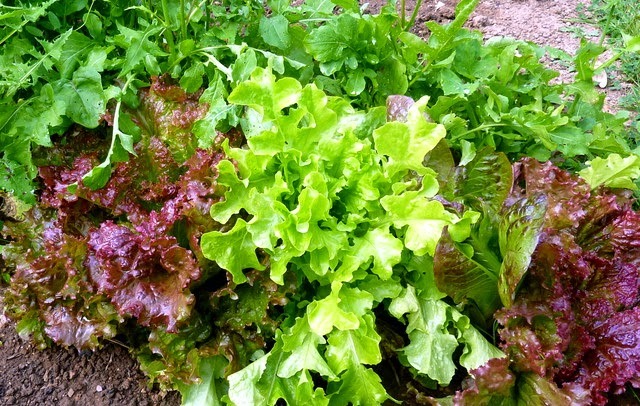 Lettuce soup, better than gazpacho! Time to introduce you to two ladies whose talents lie in quite a different direction to mine, you'll soon see why. Lorrie @ Fabric, Paper & Thread is a blogging friend of many years who lives in Victoria, BC, Canada. On her blog you will find links to her Etsy store and Craftsy page where she says " I love to sew and create in a variety of mediums. Sewing, embroidery, paper crafts - you name it, I've probably tried it. But I always come back to my love of fabric and sewing! " Another very talented lady is Sue @ I Sew Quilts. 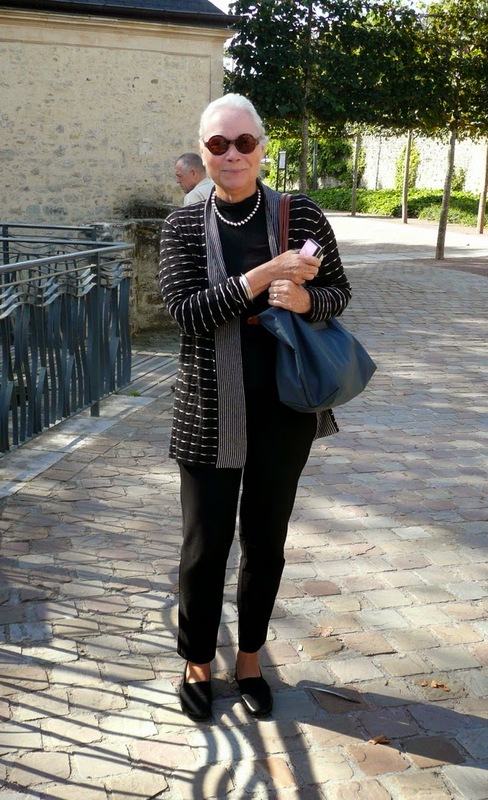 Sue and I met through the Quimper Club when we both attended the 2001 annual meeting in Quimper, Brittany. At that time she ran a very successful store aptly named “The Pumpkin Patch”. Sue’s blog is a feast for the eye, not only does she share with us the projects that she is currently working on but takes us travelling around the UK and the US, to the many museums and quilt shows that she visits with her quilting friends. I’d like to thank Sarah for inviting me on the tour and you, too, for your company today. for the next sequence of the Blog Land Tour. Personal Photo Challenge - August. Animals. 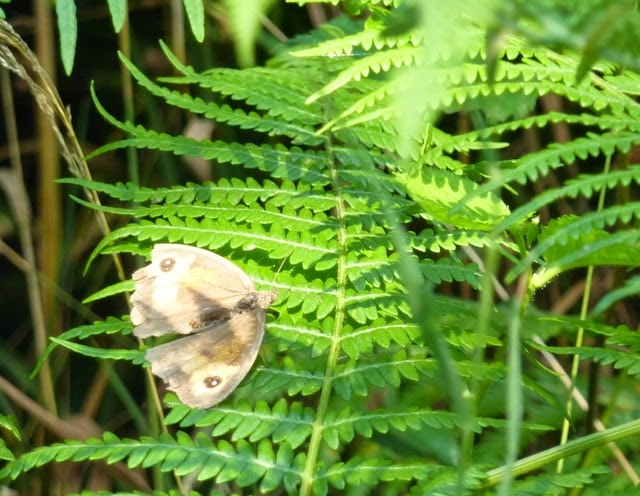 Despite having my camera with me wherever I went last month I encountered just four types of animals. Dogs, M'mselle Fleur our beautiful German Shepherd is always nearby and has featured on this blog many times. 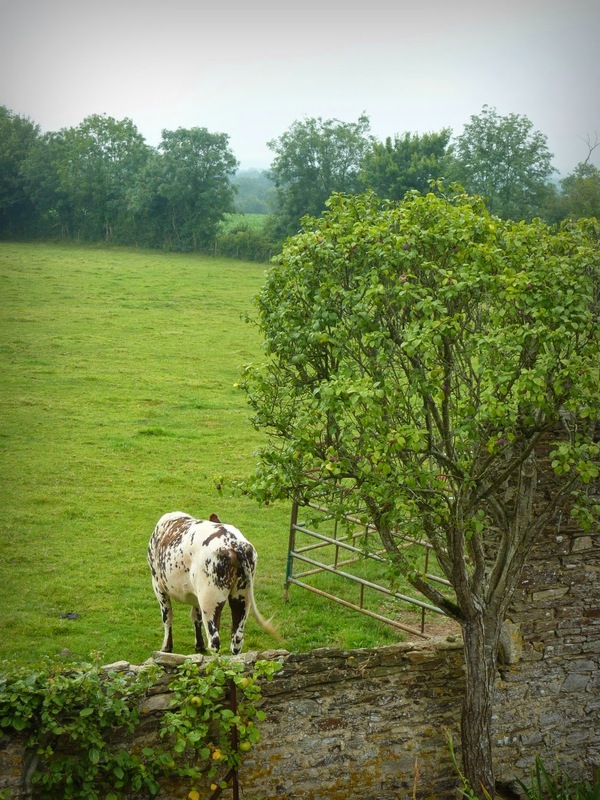 We often see horses in the fields when out for a walk. Sheep.......I know! I can hear you saying "not sheep again". 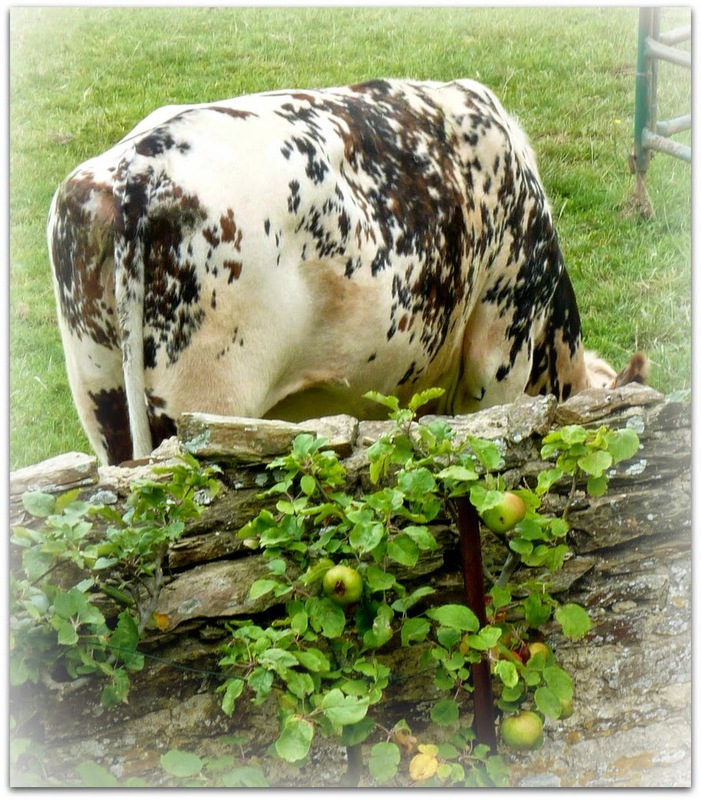 And, of course Normandy cows. Our home is almost completely surrounded by cows. They have taken up residence in the fields to the left, to the right and behind us. 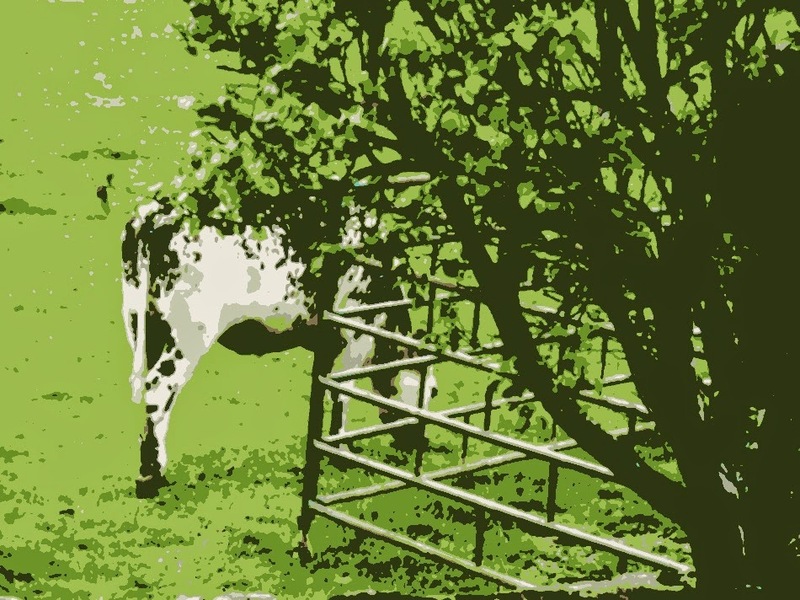 I took these photographs through the open bedroom window and then played with them in Picmonkey. A gentle bucolic scene that I never tire of. hosted by Donna @ Cottage Days and Journeys. 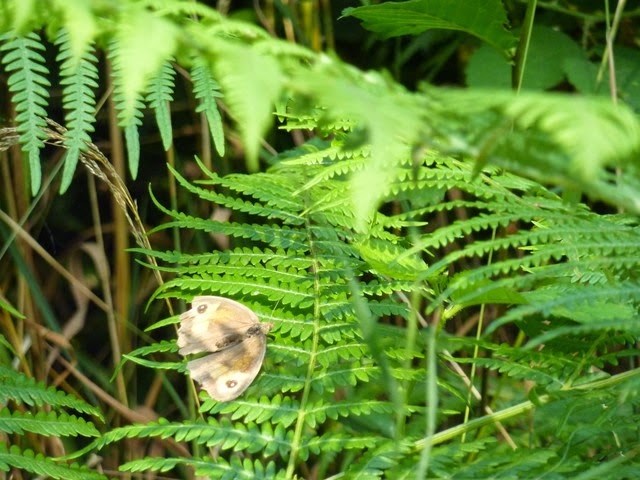 Walking along the lane recently I couldn't help but notice all the little cream and brown coloured butterflies flitting in and out of the ferns. 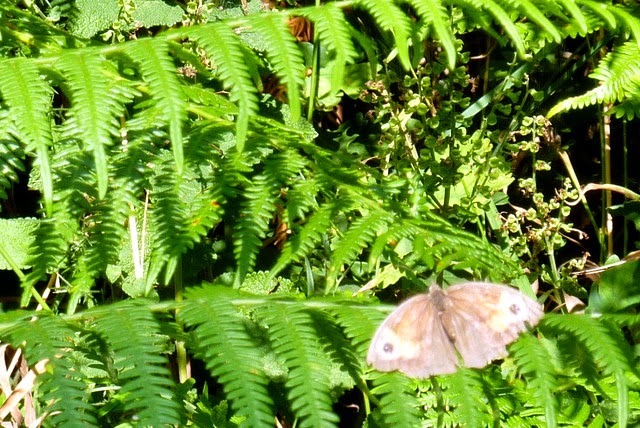 I stopped so long to photograph them that the SP & Fleur got tired of waiting and walked on, leaving me behind to snap away. 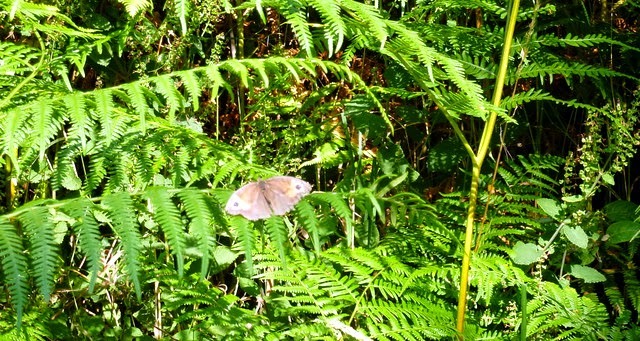 I was fascinated by the markings on their wings and the way the sunlight dappled on them creating shadow and contrast. 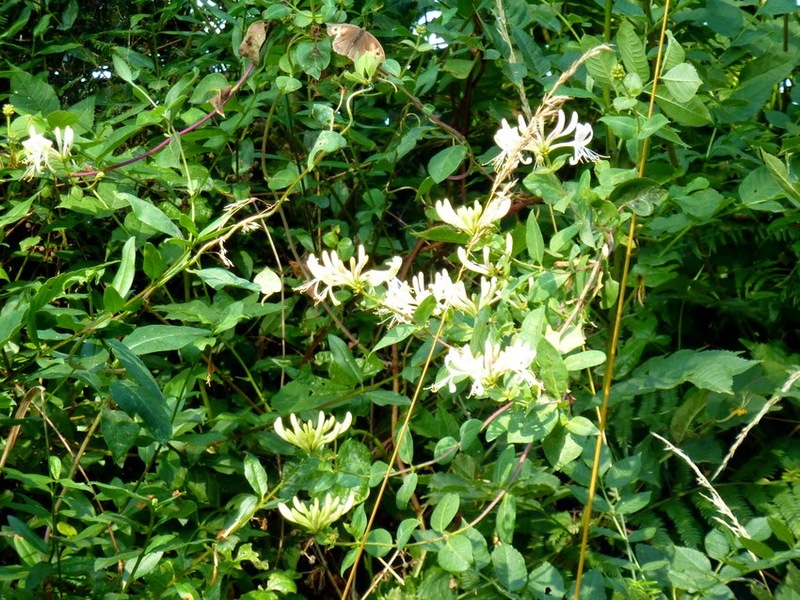 Perhaps it was the wild honeysuckle threading it's way through the undergrowth that was so attractive to them? Getting back in the car I was amazed to see how high the mais is now, high as an elephant's eye! 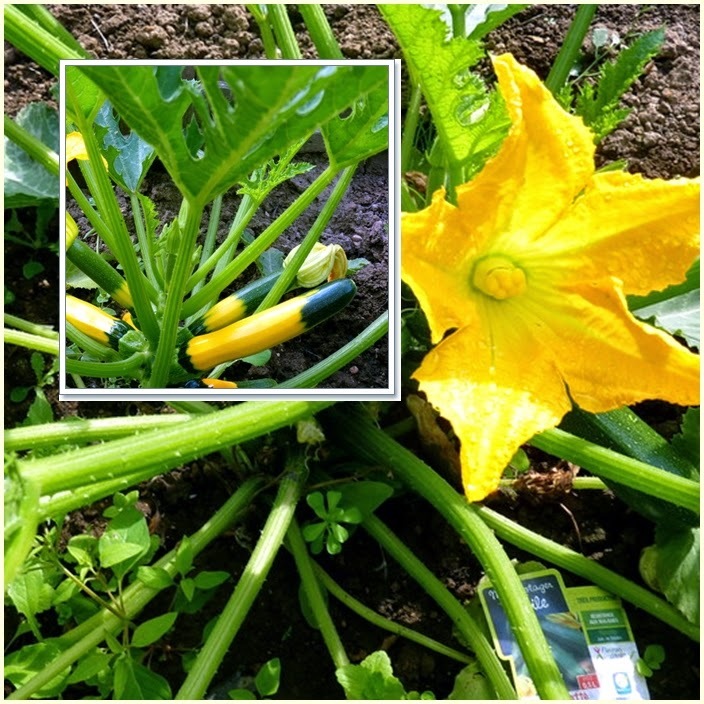 During the summer months the potager comes into it's own, providing wonderful fresh produce for the table. Watering always takes place either late at night when the bats come out to play or early morning whilst waiting for the coffee to brew as happened today. When I noticed the way the water drops on this opened courgette flower sparkled in the early morning sunlight I had to dash indoors and grab my trusty Lumix. 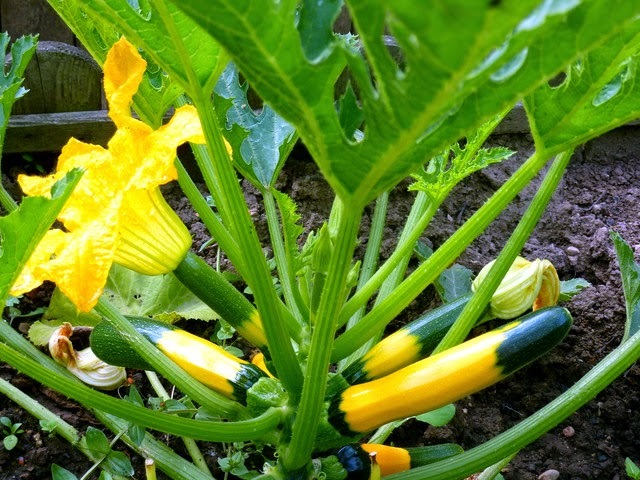 Did you know that technically courgettes/zucchini are a fruit not a vegetable? You can use them in cakes and tea breads as well as many savoury dishes. 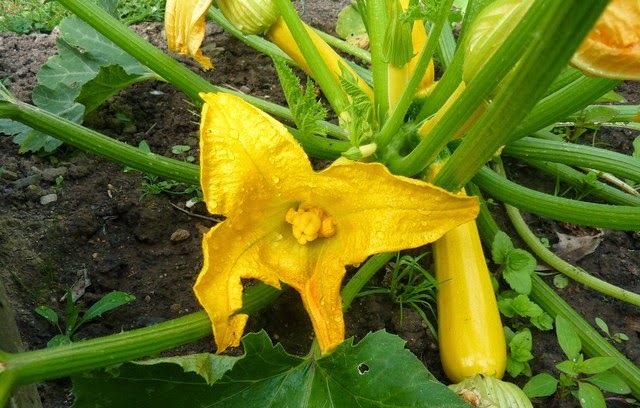 These two plants are identical yet one bears yellow fruits and the other yellow and green. They have both been quite prolific so I'm trying out all sorts of ways to prepare them. Fritters and casseroles are always good standbys but our favourite recipe this year is for courgette pesto pasta which makes a great BBQ side dish and the cold leftovers (if there are any) are delish. 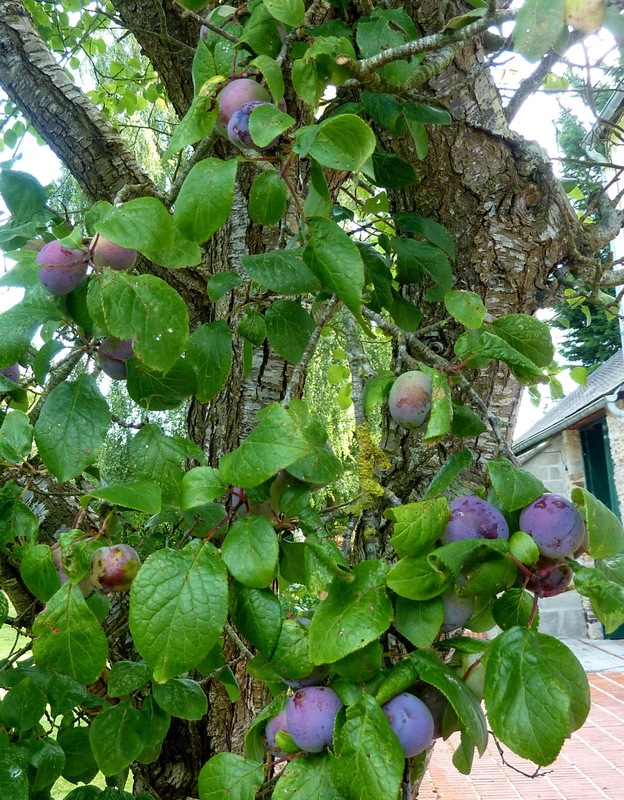 The plum tree has plenty of fruit on it this year, I hope that the birds leave us some and don't steal all the plums, after all they've already had the cherries, raspberries and blueberries. 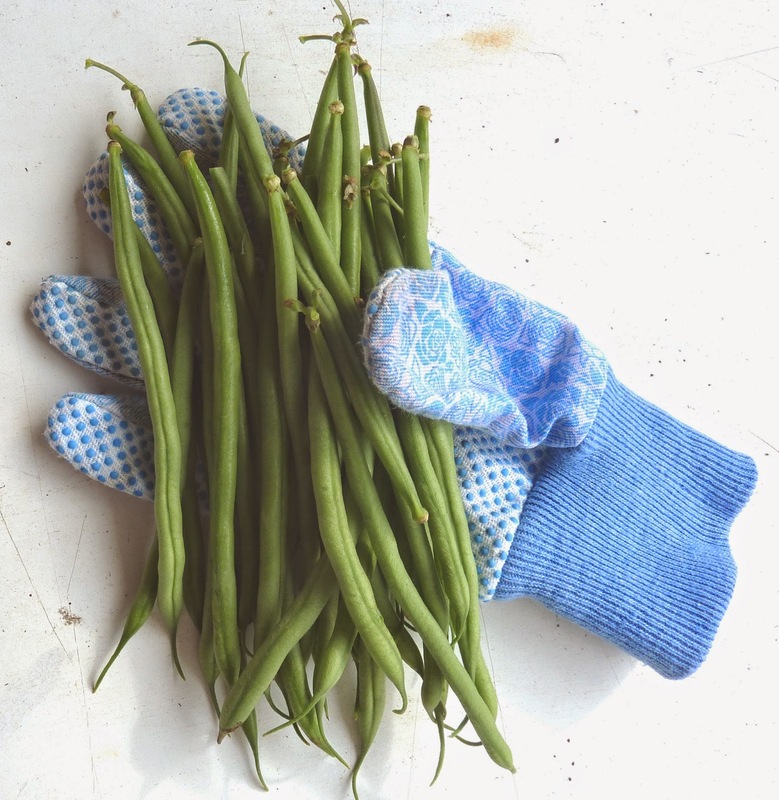 Soon the coffee was ready and calling me back to the kitchen, so I picked a good handful of dwarf haricots for tonight's dinner as the SP is planning on cooking pork tenderloin medallions with a Dijon mushroom sauce, c'est magnifique!